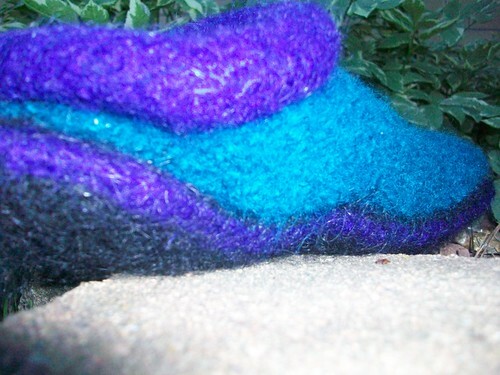 A brief history of Felted clogs as knit by Karen. 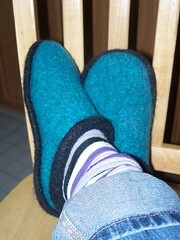 My first foray into felted clogs. Ignored yarn requirements, bought two skeins of clog color and one of sole color. Made it work by holding clog color and sole color together for inner sole of clog. Purple and black. Paid attention to yarn requirement, apparently forgot how to count though. Compensated by picking up or dropping stitches randomly throughout to keep the stitch count right. Clogs still turned out super cute. 3. Made for Debbie. This pair was practically perfect except that I used a different kind of yarn. On my prior escapades I used Cascade 220 or Brown Sheep Lamb’s Pride. For this pair I heard that the brown sheep naturespun felted a lot faster – as I do my felting in a front loader this was ultra appealing. What I did not expect is that it would felt totally differently than the other yarns. I consider this the wonkiest looking pair ever and there is not picture as I think they were felted at about two minutes before they were gifted. They are also the warmest thickest pair I have made- so the recipient was still quite happy. 4. Made for Beth – again no picture – again, finished at the last absolute possible minute – there may be a pattern here but I refuse to acknowledge it. 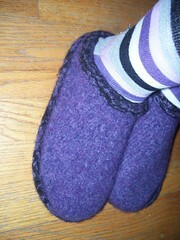 Lavender with purple soles – I used Hobby Lobby I Love this wool, and it was a slower start felting, but once it decided to felt – it felted. 5. Made for Kacey – and since these live with me and are frequently spotted in the wild (she wears them to school..yeah I am that mom, the one who lets her kid wear their slippers to school…) but still – no picture. 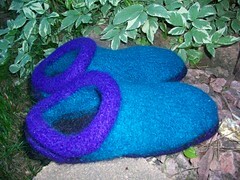 These were a complete hybrid knit – all or the other purple and black leftovers held together in an amazing yarn conservation sytem effectively using all kinds of leftovers and still becoming felted clogs. who is graduating high school, and is nice to my freshman kid. The idea struck and I raided the stash using one skein of Brown Sheep Naturspun in bulky weight to knit all four soles! Beware clog knitters – this left ONLY enough to sew the sole together, not enough to do the cuff or attach the second sole, so for that I went back to pair No. 3 and used some of the purple to do the job. The blue was a skein of Lion Wool I had around thanks to my inability to resist a clearance sale. The best part is these have a little racing stripe around the sole, which can not be considered sporty, since this is a slipper, but sure is cute. 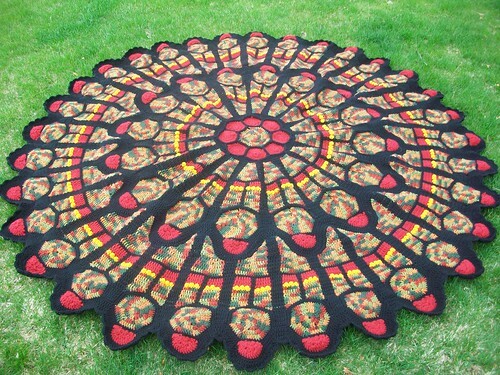 So a long long time ago, in a galaxy far away I saw the ultimate afghan pattern. I figured I would never make one, but set about checking on the pattern anyway…you know…just in case. Well it turns out that the pattern was from an old Annie’s Attic book – long out of print. 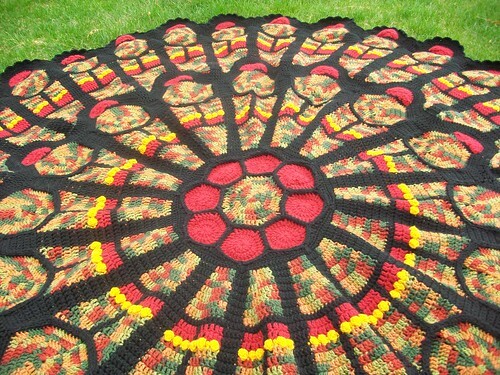 The problem here is that now not only was I liking the afghan, but it had been deemed unattainable – making it that much more interesting to me. I began emailing Annie’s Attic and asking for a reprint. Using multiple email addresses so I would look like a lot of people (Sock Puppets’R’us) Anyhoo, whether my emailing worked or whether someone at Annie’s said “hey look, people are paying lots of money for this old book – maybe we should consider it….” I will never know. But the unattainable FINALLY became attainable. < Now you can even download it, saving yourself the mind numbing two week wait for slow boat shipping via smartpost. I bought yarn and proceeded to attempt this blanket during the summer Ravelympics of 2008. If I could crochet 24 hours a day I might have finished it. Being a human (and apparently a mother – short people in my house kept asking for things…they must be mine… they look like me) I did not succeed. Not only did I not succeed I burned myself out on it. So I put it away…far far away. Finally when Ravelympics 2010 rolled around I began to think it might be a good time to break it out again…and this time there was actually a pretty good chance I could have finished it – except for the short people. The tallest of the short people volunteered me to help with costumes on a musical where the sewing of 19 skirts and the hemming and altering of a multitude of ballgowns began. So I basically failed at finishing for two consecutive Ravelmpics. But the afghan did in fact finally get its day. In truth it got finished a couple weeks ago, but this is the first chance I have had to give it the blog post it is due. 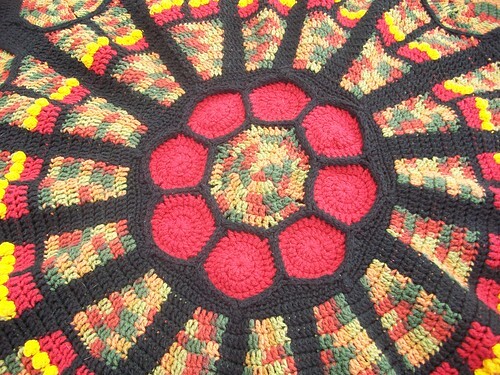 At a total of 84″ from side to side there is a deceptively HUGE amount of crochet here. Entirely Red Heart Super Saver <1. It had to be washable. HAD to be. 2. If I made it of anything else I would have had to put it in a safe deposit box – the yardage in this thing is….intimidating. While I was making it I had my doubts, but once it had been washed and dried it is nice and soft awesome for snuggling with. The totals? 18 skeins of Super Saver – with not a lot left over. That is a total of 5,712 yards of yarn. 3.25 MILES of yarn. The pattern is surprisingly easy – at times it is mind numbing. the fortunate thing is the construction is genius so that a little common sense can carry you through when nothing else does. And the final product? Amazing. Beautiful. HUGE. Great for a snuggle with a short blanket thief, there is enough to go around 🙂 I am so happy I finished this that it makes me giddy – and every time I sit wrapped up in it, or toss it over the back of the sofa I get a little thrill of accomplishment. So there it is the long path from UFO to FO, the agony of defeat, the thrill of victory, and the need to find a new long term project.